Peeter Joot's Blog » UPS customs clearing scam hits new extremes! In addition, Canada has one of the lowest exemptions for duties on personal shipments — $20 — which is why so many people use the “ship to the border” services. With a 24 or 72 hour stay in the USA, you suddenly can claim under the $200 or $800 personal travel thresholds. Raising the postal limit to the 24hr personal travel limit would greatly limit the revenue streams for “brokerage services”, at least for residential shipments. I did successfully do the self-clearing procedure, and the customs officer did waive all the fees, which should eliminate UPS’s $70 handling fee for the $2 charge. All of the items were marked as gifts. 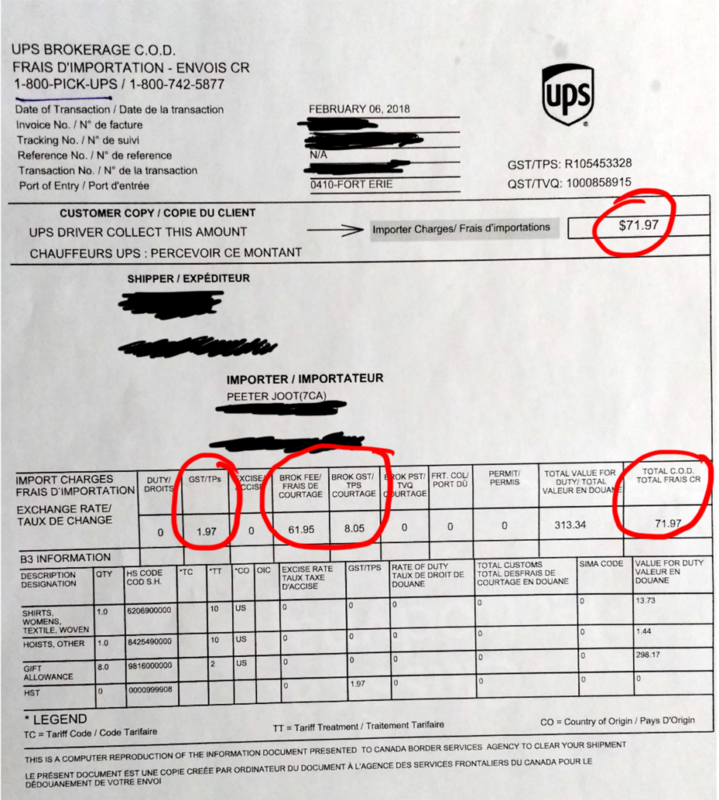 I think the root cause is either a money grab by UPS, or somebody just being lazy, and figuring that people will just pay if charged despite being inappropriate. Seems like the “gift allowance” as assessed by UPS was calculated arbitrarily and was just low enough to require taxes to be there collected. That’s quite a scam. Why does the value for ‘Total value for customs’ spell eleet as in ‘calculator-language’? Or am i seeing ghosts?